I love the Victoria Secret's Models, I love their hair and make up, and today I'm going to talk about Miranda Kerr's Makeup. I found a youtube video with her Make up Artist Noni Smith where she talked about Miranda's makeup. Her look is all about minimal glowing skin and Miranda prefers the focus on the lips rather then on the eyes. Skin- Miranda doesn't usually wear foundation she wears concealer and one of her favorites is a mineral concealer by Illuminare. Blush- Nars Cactus Flower Cream Blusher and sometimes on top of that she likes to add Chanel n 70 Tumulte Blusher. Eyebrows- Miranda is very particular with her eyebrows most of the time she just uses a clear eyebrow gel from mac or sometimes eyebrow powder. Lips- The fun part! Miranda loves a red lip a few of her favorites are Chanel Rebelle and Nars Red Square, she likes orange base reds. 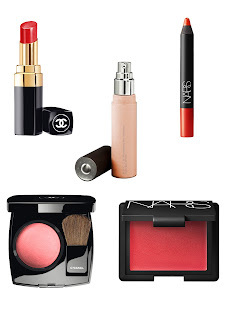 I'm definitely putting these items on my makeup wish list! I watched the video before I found your post but the products were kind of slipping my mind and getting scrambled together but this compiled list and detail is, it is really quite helpful! Thanks for taking time to type this all out, thank you!